What's worse than pit bulls and their nutters in your neighborhood? Pit bulls with nutters who follow you into neighborhood shops, restaurants and hop on the bus with you. It's all the rage right now. If you don't mind lying and committing fraud, all you have to do is have or pretend to have a disability and pretend your pit bull is trained to help you with it. Slap a vest or a laminated tag that says "Service Dog" on your pit, buy a meaningless "registration certificate" and you're all set! Because her seizures can occur anytime, at least one dog needs to be awake to help her at all times. Seems the service dogs being pit bulls hindered the Merrill family housing search, forcing them to live in a campground for a while. If these were actual service dogs and Missy had a legal disability, everyone who turned the Merrills down would have committed a crime and infringed Missy rights under the new ADA guidelines, yet there is no mention of anyone alerting authorities to redress the issue. Instead, Melissa went to the media, and told a lot of lies. Here is a list of the lying nutter's pack of lies, identified with help from people at Service Dog Central who discussed this scammer in their discussion boards. There is no government or ADA accredited registry for service dogs. 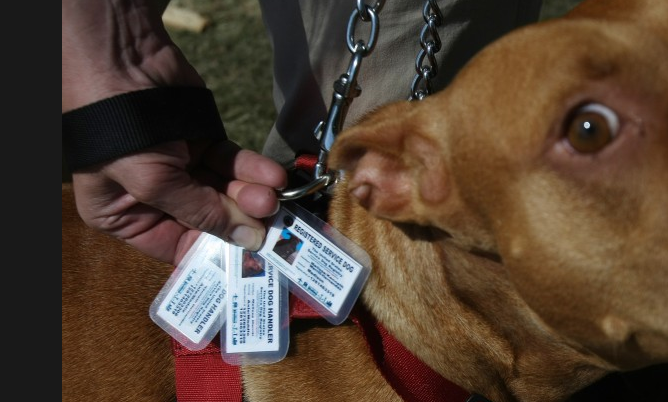 Some municipalities have voluntary certifications, and training facilities certify that the dog has passed their training program, but most people who rely on certificates and registries as proof, have just bought a piece of paper from an online scam operation. You don't need "a note from your doctor" if you have a disability. In the United States, "disabled" and "disability" are legal terms, not medical terms. If the legitimacy of one's disability were challenged in court, a judge could consider a doctor's opinion, but would not be bound by it. Some municipalities allow people to get a prescription from a doctor to travel with an emotional service dog, though these are not considered service dogs by the ADA. A close up of the tags (See thumbnail images below the nose washing photo) on the one dog shows that there are 2 different picture IDS of two different "service dog handlers." So, not only does one person seem to own 2 service dogs, at least one of the dogs is serving 2 handlers with disabilities. Again, unheard of! Incidentally, service dogs and their owners are not currently required to be in possession of or to show any proof of disability or of training for the dog. What would "responsible" pit owners say about this reckless, irresponsible, fraud pit nutter? You know, those pit nutters who yell to the rooftops, "I'm Educated! I Have a Job! I'm A Professional! I Own My Own Home! I Don't Live In A Campground!" Well, when she's a pit nutter veterinarian living in the Miami-Dade County pit bull ban area while hiding an illegal pit bull, she'd say, "I found a loophole!" and write a blog post about it. She did this because she has no idea what the word "loophole" means. The essence of the loophole is that it is LEGAL. It may be unethical, unsavory, unwholesome and unintended, but it is legal. What she is telling the whole world, and ultimately the Dade County ADA office, is she's breaking the law and willing to commit fraud! Patricia Khuly VMD, MBA2 writes very succinctly in her Fully Vetted blog (See: Pit Bulls in Miami-Dade Find a Loophole, But is it Fair?) that though she has in the past condemned other people for making their pit bull into fake service dogs, now that its convenient for her to do so, she will. And she'll call it a political statement to make herself feel more important. 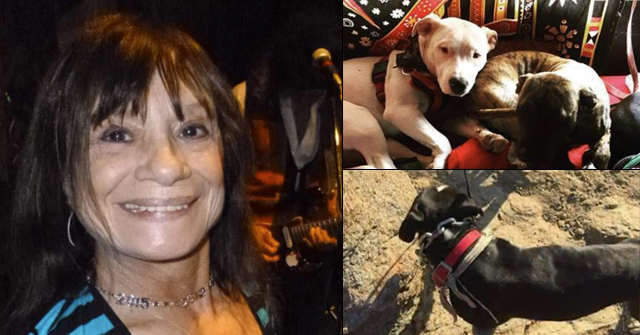 The centerpiece of her evil plan was to get her pit bull, Pinky, certified as a therapy dog. She was then told, repeatedly, and by people who own service dogs, that a therapy dog is NOT a service dog and not covered under the ADA and that certification does not protect her pit bull from being rounded up and euthanized. (Pit bull owners in Miami-Dade, like those in Denver, flout these bans because they have nothing at stake, and they don't mind one whit putting the life of their pit bull in very real jeopardy.) Apparently, she only removed Pinky to safety outside the ban area after a complaint was lodged with a website to which she is contracted. Vaya con Dios, Pinky. The result of veterinarian Patricia Khuly's advice will likely result in more tragedies like poor Buddy's demise in front of dozens of people within the close confines of a bus. Buddy's neck was broken and he slowly died from blood loss in his elderly owner's lap after a "50-pound Rottweiler-Shar Pei mixed breed dog" attacked him without provocation. The breed description for a male Rottweiler includes a weight range of 110 to 130 pounds. 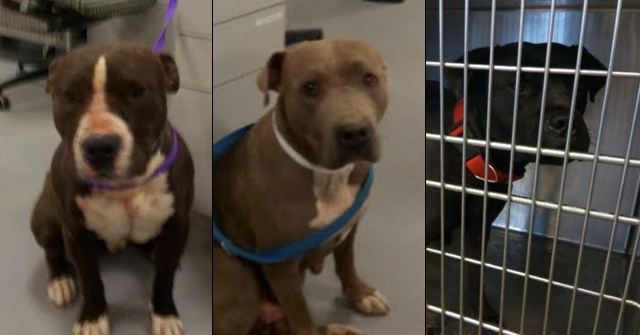 Without a photograph, it is hard to imagine a 50 pound rottweiler mix, however it might look a lot like these 50 pound, full-blooded pit bulls with black and tan markings. Unlike virtually every other country that has legislation concerning service dogs, no U.S. governmental agency, including the ADA, accredits service dog training. It is legal to train one's own dog, and no identification of any kind is required as proof of being a trained service dog. Business owners or public service workers such as bus drivers may not ask what kind of disability a person has because to do so infringes on the civil rights of people with disabilities. In the U.S., only a judge can make a definitive determination as to the legitimacy of a person's disability, which means the only way to dispute a claim is to go to court unless the individual admits to the fraud. The handler/owner must have a disability; otherwise the dog is just a trained dog. 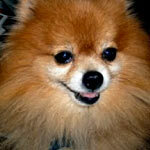 The dog must be obedience trained so that the owner can maintain control of it at all times. The dog must be individually trained to perform tasks the owner is unable to perform on his/her own. Here is the description of the very high minimum standard of training a legitimate service dog is generally expected to have. Specifically address and penalize people who misrepresent themselves as disabled and/or misrepresent their dog as a service dog. Establish a voluntary government accredited Service Dog Certification program. 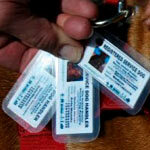 Issue tags identifying the dog as having passed the Assistance Dog Public Access Certification Test or a similar test. In addition to new legislation, educate the public both about the civil rights of people with disabilities and the rights of business owners and the public to help assure that scammers can't bring potentially dangerously untrained and aggressive dogs into stores, buses, movie theaters, zoos and more. Do you have a disability? This is necessary because, by definition, no dog can be considered a service dog if the handler does not have a disability. However, the handler of the dog cannot be asked the nature of their disability. What tasks is the dog trained for to assist you? According to the ADA, all service animals must be trained to perform a task or do work that the handler is unable to do. To preserve privacy, the handler may answer vaguely. Vague answers include, but are not limited to: Hearing, Guide, Mobility Assistance, Medical Alerts to pending medical conditions. Whether the dog is a fraudulent service dog or a poorly trained and controlled service dog, businesses have not only the right, but the responsibility to eject all uncontrolled dogs. The ADA requires that the handler be given the opportunity to get the dog under control before it can be told to leave. The business can require that the dog leave, but they can't "kick out" the owner. Genuine service dog owners are very highly motivated to find a dog that has a highly dependable "bombproof" temperament and to maintain the dog's responsiveness and skills through continued training. Typically, service dog owners pay a lot of attention to their dog's hygiene because expectations are high for a working dog that may go into a restaurant or store. This sets the genuine working service dog far apart from the typical pet. Allowing pit bulls and other pets to masquerade as service dogs is dangerous for everyone. 1After a pit bull kills a person, family members sometimes blame the attack on the person's "history of seizures." 2Patricia Khuly is a pet health columnist for USA Today. Though lacking a PhD, she clearly fits the definition of an ethics sell-out. Perhaps you would be interested in background on Patricia Khuly, alleged veterinarian. Patricia Khuly is involved with the breeder lobbying world. She has long been producing propaganda for, in particular, the AKC breeder lobbying world. That is what her column is- pure propaganda for breeder financial interests as she abuses her DVM and tries to pretend expert status. Their breeder propaganda business is called Pet Connection. This is how the breeding industry has infiltrated the media. It's like, as someone pointed out elsewhere, having a tobacco company lobbyist write general health columns for the local newspaper. Patricia Khuly is representing the money interests of pit bull breeders with this article, in particular the AKC Staffordshire Terrier (pit bull) breeders. She is participating in the coverup of the deadly problems that pit bulls have so that her associates in the AKC and elsewhere can continue to profit from pit bulls without regulation. The real crime here is that a newspaper is allowing a business industry lobbyist to abuse the public by pretending to give expert information that is simply public relations propaganda for breeders, in particular breeders that produce dogs who kill people. Financial interests of breeders, of course, conflict with public safety and other issues. A newspaper or media source is acting unethically by allowing a lobbyist from that industry to abuse the public's trust. In this case, this abuse of trust may well lead to death or serious injury. "U.S. Shelters That Euthanize are just like Psychopathic Bosnian Teens Who Throw 6 Week Old Puppies into a River on Videotape"
When the AKC and their lobbyist Rick Berman decided to use Nathan Winograd as their mouthpiece to avoid regulation and attack animal control that investigates abusive breeders and puppy mills (with lots of fake outrage and blame about euthanasia,) Spadafori, Khuly, and Keith went on an AKC fueled public relations campaign for Winograd No Kill, as directed by Rick Berman and Berman's organization Center For Consumer Freedom, which also is connected to AKC board member Patti Strand and her breeder lobbying group NAIA and PetPac. These breeder lobbyists all work with each other. As far as pit bulls go, pit bulls are and always have been bred to be fighting dogs. The breeder lobbyists try to concoct new "reasons" to breed and use pit bulls that they hope that a naive public will accept so the naive public does not demand laws regulating these fighting breeds. What kind of therapy was Khuly claiming she needed? Is this affecting her performance and judgment as a veterinarian? Should her state licensing board be aware of this? Thanks for addressing this topic, it is long overdue. I hope the cities struggling with this issue take note and work to pass laws that require real certification and stiff penalties for those who violate them. And I hope the state of Florida will look into Dr Khuly. This is how Khuly was hired by USAToday, through her affiliations with the AKC. It is likely that the publisher does not realize that they were hoodwinked. It was up to "reporter" Jomay Steen to do her research and homework and figure out she was being conned. Instead, we got more propaganda, more falsehoods, as Jomay Steen puts the public in danger. As these scammers attempt to force their fighting breeds into rental housing and public areas like restaurants, they are of course not realizing the key problem. Many landlords and business owners do not allow pets on their premises because many tenants and customers have deathly allergies to animals! People, and these include a large number of children, have been directed by doctors to stay away from animals and not to live in a building or area with animals. With the higher allergy and asthma rate, people like Khuly and Melissa Merrill are putting people's lives at risk not only with their fighting breed pit bulls, but also through instigating potentially deadly allergic reactions to their dogs. Forcing other tenants and customers to inhale the dander and allergans that these dogs spread about through an entire building and ventilation system is criminal, and the law needs to protect the huge population of truly disabled people with animal allergies. Even if the buildings are separate, the allergans are spread throughout driveway, garage, walkway, garden, yard, play areas. People who have been affected by a fellow tenants pit bulls need to see remedical relief from the courts for the damage that these dog owners have caused. No child should be forced to endure asthma attacks because a scammer is using the service dog loophole to force pit bulls into their residence. It will be especially poor children who suffer because of the Khulys and Merrills. i am so glad you covered this! i saw this story about melissa merrill and i didn't have time to address it. there are many holes in her story. 1) that is quite a stretch calling the short coated brindle "service dog" a gsd mix. 2) merrill claims that 98% of the landlords turn her away, yet she is homeless. what about the other 2%? are pit nutters really this stupid or do they just makes this BS up as they go? 3) IF she has a disability and IF her dogs are in fact trained service dogs and IF they can not deny housing, why isn't she presenting these tags? why is still lying about her dogs? 4) who needs TWO service dogs? who in their right mind would believe the applicant was telling the truth about their dogs when they claim to need 2 of them because one of them needs to be awake. HUH? 5) who in their right mind would come to her aid with those 2 dogs guarding her? i would not help this woman if she was on fire with those 2 pits sitting next to her. i don't remember where it was but recently a woman had a heart attack while on a walk with her dog. 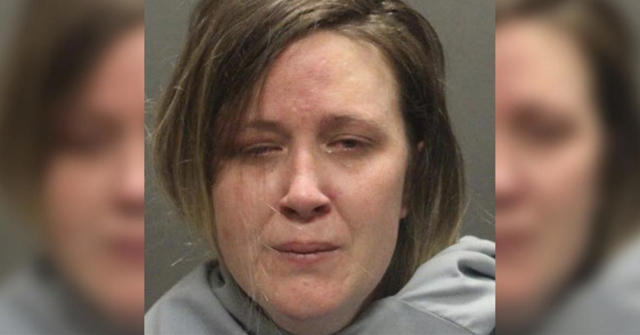 her pit bull needed to be tasered to render assistance. and this freaky vet, wow… i poked around her blog and i have to wonder if she is in the online advice business because she can't cut it in the real world. in addition to being unethical, she is arrogant and condescending. What an idiot! She tries to compare gun laws to pit bull laws in an April piece. Guess what Missy? PIT BULLS ARE NOT PROTECTED BY THE SECOND AMENDMENT OF THE UNITED STATES CONSTITUTION NOR ARE THEY PROTECTED BY ANY PART OF THE CONSTITUTION. "i poked around her blog and i have to wonder if she is in the online advice business because she can't cut it in the real world. in addition to being unethical, she is arrogant and condescending." I believe that you have had a taste of the AKC breeder world. I cannot tell you how sociopathic the AKC breeder contingent is, and they are a reflection of the other subsets of the breeder lobby. These people are filled with hatred and antipathy toward nearly everyone. They only care about their obsessive breeding interests, and many of these breeders are actually mentally disturbed. If you read their breeder boards for any length of time, the hatred, anger, and arrogance is overwhelming. Even most children have more self-control and intelligence. The attitude of these breeders is that they are special, they should be able to do whatever they want without any kind of law-abiding expectation, and that they have some sort of special abilities that the world should worship. There is no empathy for other humans or animals whatsoever. Anyone that is perceived as a threat to this fairy tale world is attacked rather violently, and the gang piles on like a pack of, well, pit bulls. The carelessness and lack of concern about killed and mauled human beings is chilling. As usual, at the heart of such obsessive behavior is money, because most of them do not obey the laws of our country and pay their taxes on their breeding business income. They believe they are above the law, in just about every way. Antisocial attitudes and behavior prevail in every way. The question is, why would any respectable media source want to be associated with this marginal and abnormal cult-like group? 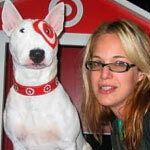 "She tries to compare gun laws to pit bull laws in an April piece. Guess what Missy? PIT BULLS ARE NOT PROTECTED BY THE SECOND AMENDMENT OF THE UNITED STATES CONSTITUTION NOR ARE THEY PROTECTED BY ANY PART OF THE CONSTITUTION"
Again, this comes from the AKC, and related breeder lobbies. The AKC has declared that dogs are "property" and that no one may make any laws over their "property" therefore breeders may do as they like unrestricted by any laws. Of course, this makes no sense whatsoever in a country of laws where laws about property are rampant, and it also holds these breeders accountable for their "defective property" ie dogs specifically bred to be dangerous that kill. But that doesn't stop this selfish declaration of special status by breeders. The AKC holds "Legislative Empowerment" seminars where they teach breeders and other dog owners how to oppose legislation and regulations. This consists of creating the same myths, lies, fabrications, and propaganda that you see here with this pit bull service dog scam. They also use "Legislative Liaisons" from their ranks to orchestrate propaganda campaigns within communities, such as with the media and legislators, to oppose regulation. 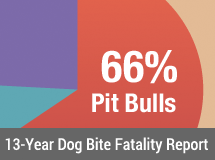 Some of these Legislative Liaisons have even brought pit bulls illegally to schools to try to indoctrinate children with propaganda, without mentioning of course that pit bulls are the top killer and attacker of kids. They will attempt anything to oppose regulation of dog breeds and breeding. It's emotional manipulation. It's outright deception. They do not care about the innocent public suffering the consequences of their breeding activities. 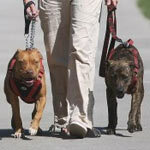 The ranks of "therapy" (not service) dogs are about to swell mightily with pit bulls. Soon after, there will be a rash of attacks involving "therapy" pit bulls. Following will be an overhaul of the "therapy dog" industry and it will be lot harder for these two-bit organizations to hand out credentials for cash. The public will also come to understand a little better how dangerous these dogs really are – it will be harder to blame "attack training" and "poor socialization" when the dog has been "therapy certified", won't it? Maybe the end justifies the means? BB, if that didn't mean that innocent people, such as school children and the elderly, would be the ones paying the price for the fraud, I'd agree with you. As it is, I sincerely hope that lawmakers quickly see this loophole for what it is and shut it proactively rather than reactively. James Grieble declared his pit bull a service dog and attempted to take it to his son's elementary school, where the dog "was observed chasing children while she was leashed…and James made a threat to set her loose on the custodian". Presumably this threat was made when he was asked to remove the uncertified dog from the school grounds. Wow BB, this story is so frightening and so well illustrates the problem fake service dogs are causing. The school did NOT know their rights or the rights of the person in the wheel chair. If they had simply known to tell the man that he must get his service dog under control immediately or remove it. And that would be the end of their problem. Instead they request certification…which is not required. As for the man with the disability, he stated that the dog pulls his wheelchair. That is NOT a trained behavior that would qualify the dog as a service dog under the ADA. Obviously, the dog is marginally obedience trained by pet standards. It does not come near to the obedience training required of a service dog which requires that the dog not solicit attention from other people when "working." The owner of the pit bull obviously was completely unaware of the ADA requirements either. Proffering a note from a doctor almost proves his dog is a fraud. To think of the dangers this guy is blithely subjecting those children to…it is sickening. And to think that if he is truly disabled, and putting his safety and well-being in the paws of a barely trained pit bull puppy that just pulls him down the street, well, the guys crazy. On the service dog central board, one of the members says the wife contacted her admitting that the dog became aggressive, and excusing it. The member replied that a service dog should never become aggessive under any circumstances. I ran into a fake pitbull service dog (supposedly in training) in the hall of a busy hospital. I reported it to the hospital administrators and security at St. Mary's Hospital in Grand Rapids Michigan. They did nothing. There are several factual errors in this article regarding disability rights laws. 1. The ADA is a civil law, not a criminal law. One cannot commit a "crime" for violating a civil law. Civil laws are enforced by courts, not authorities. To get enforcement, the aggrieved party must sue the party that infringed on their civil rights. 2. Some (but not all) states do have criminal laws on the books for falsely claiming a dog is a service dog. I worked in my state to get such a law passed. In my state, the penalty is $1000 and/or 6 months in jail for the human and of course euthanasia of the dog if it is of a banned breed. 4. Changes in the definition of "service animal" under 28 CFR 36.104 did not make it possible to use a pitbull as a service dog or to falsely claim a pet pitbull was a service dog. That had already been the case since 1990 when the ADA first became law. All the Department of Justice did was respond to requests to put breed restrictions into the regulation at the same time they were putting in species restrictions, by explaining why they refused to do. Just a note — people with disabilities do need medical certification in order to have disabled parking placards or plates (at least in California.) Also, receiving reasonable accommodation in the workplace requires medical verification (at least. I speak from experience.) There's ample precedent for requirement physician involvement re. service dogs, although whether doctors have the cojones to tell people "no" is another question.